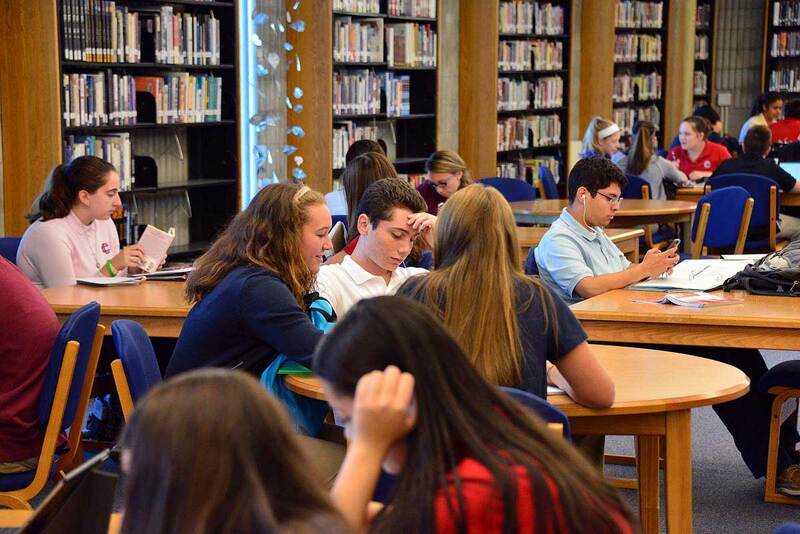 The Richard Cardinal Cushing Library & Media Center is a hub of student life. Students gather there before school, after school, and during lunch. 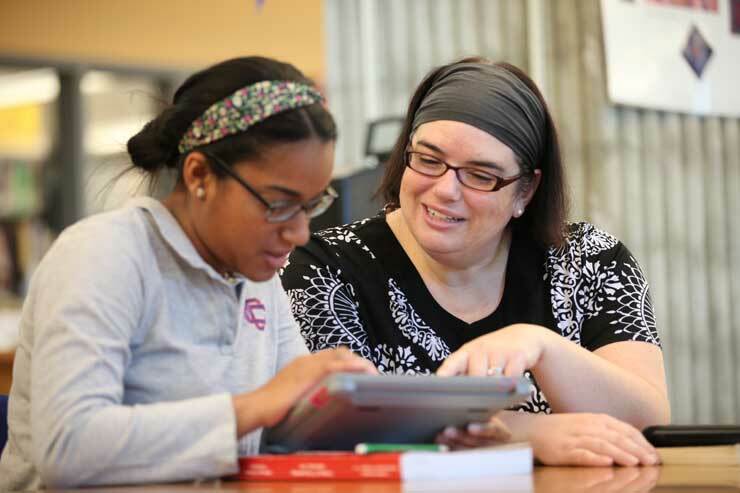 Teachers bring their classes during the school day to make use of the resources and programs offered by the Library & Media Services team. The Richard Cardinal Cushing Library & Media Center maintains a collection of approximately 12,000 print volumes and 70 magazine subscriptions, with access to thousands more through its membership in the Massachusetts Library System. All resources are carefully selected with the interests of students, faculty and curriculum in mind. 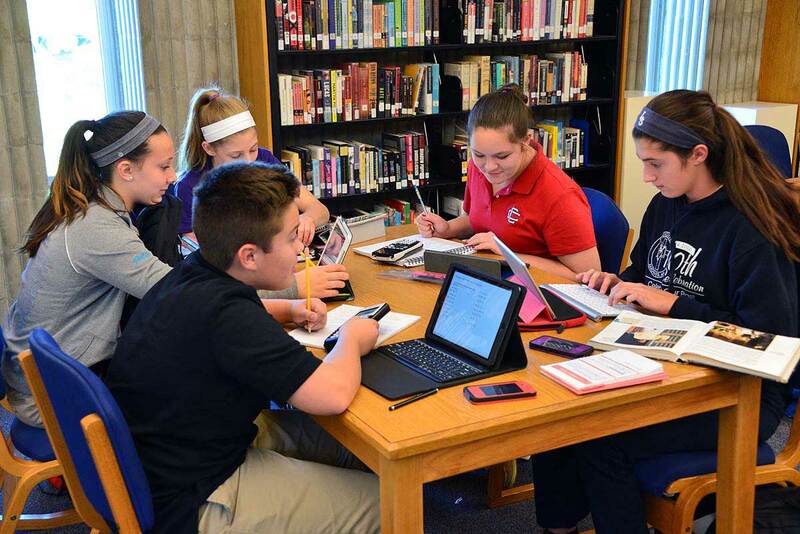 Books, periodicals and electronic resources are updated and augmented regularly to meet the ever-changing information needs of the CCHS Community. The library is fully staffed by experienced library personnel and faculty to assist students with homework assignments and research projects. The Media Production Room: Lights, Camera, Action! Making a movie for a class project? Need a place for your group to gather to film, record and edit your work? Need to do some voice recording for a narrated project and want a quiet space? We are pleased to announce that there is now a media production space in the library complete with lights, video camera, microphone and Macbook for movie editing. You might even want to try out the green screen and add in some cool backgrounds! Over the summer, a section of the library was transformed into an expansive meeting area that can be used for group work and discussion, meetings, and conferences. This newly designed area will serve as a resource for the Learning Center, classes, clubs, faculty, additional school groups, alumni, and the Board of Directors.